And now, the end (of F1 in 2013) is near, and so we face the final curtain. And more, much more than this, Seb did it his way. As expected, the 2013 driver's championship dropped definitively today in Sebastian Vettel's favour. As we probably also should have foreseen Seb went full gun after the Indian Grand Prix win even though it was much more the minimum he required to cruise safely over the title line. It seems to be the only way Seb knows. And he didn't waver from his path even after most of the small amount of lingering tension over the championship's destination evaporated in the early laps. It was an unusually madcap race (by recent standards) at the Buddh International Circuit, with the big gap between the two available tyre compounds' durability resulting in variable, jumbled fare. Various highly divergent strategies were enacted, with the 'net' order not all that clear for much of the way. 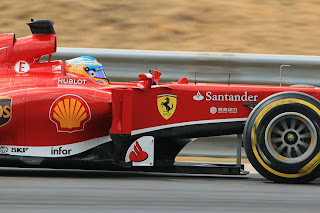 It applied even to Seb, as while he took his standard pole on soft tyres there were a couple of potential 'tortoises' further down threatening Seb's 'hare', in particular his team mate Mark Webber and his one championship rival (in the loosest sense) Fernando Alonso lurking in the pack, starting on mediums. But in that way we've long ago got used to whatever the circumstances or strategies Seb makes the best of it absolutely by blitzing the timing screens, with purple sector following purple sector. Today in that sense was like groundhog day, even though he pitted at the end of lap 2 to discard his soft tyres and dropped into the pack he continued to bear down on victory like a heat seeking missile, with decisive overtakes and rapid pace. Webber, pretty much alone, did look to be threatening his supremacy for much of the first half of the race via his unorthodox approach. But then before you knew it both had made their final stops at around the two-thirds mark and Seb was 12 seconds to the good and couldn't be caught. 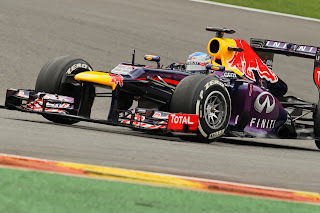 The only irritant to Seb from that point on was his own RB9. Webber dropped out with a broken alternator, and all on the Red Bull pitwall were concerned that similar would befall the other Bull. But as also seems his way Vettel was still circulating at the time of the chequered flag, and still at the front by a distance. Not also did it tape up title number four for Vettel - only the fourth driver to achieve that ever and only the third to achieve them consecutively - it also marked six wins on the bounce for him; we have to go back to July for the last time he was beaten. That's a run that only Alberto Ascari and Michael Schumacher have out-stripped. 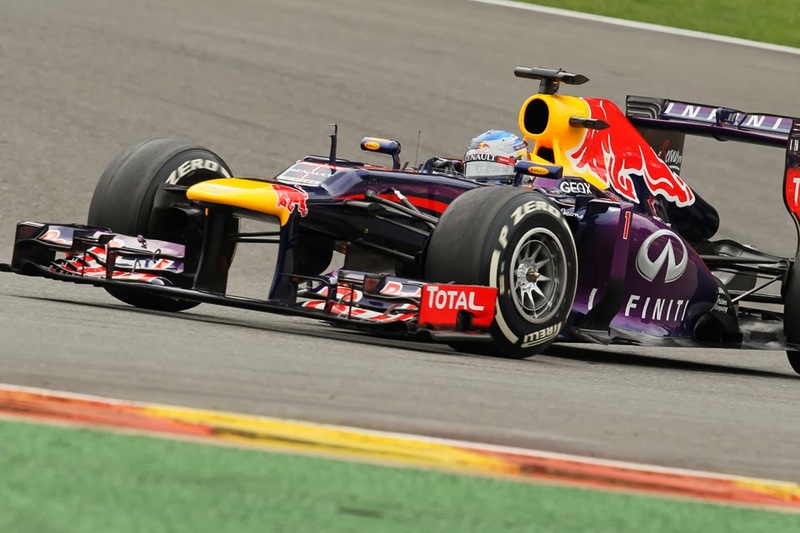 Seb will be beaten again, because that is F1's way. But in F1 right now it seems only retirements or conspicuous delays can keep Seb away from the top step of the podium. Yet while his race win was under vague threat his title was not, pretty much from the get-go. As even if Seb was to score zero then Alonso had to finish at least second to keep the thing alive mathematically at least. But from the first turn that was never a goer. 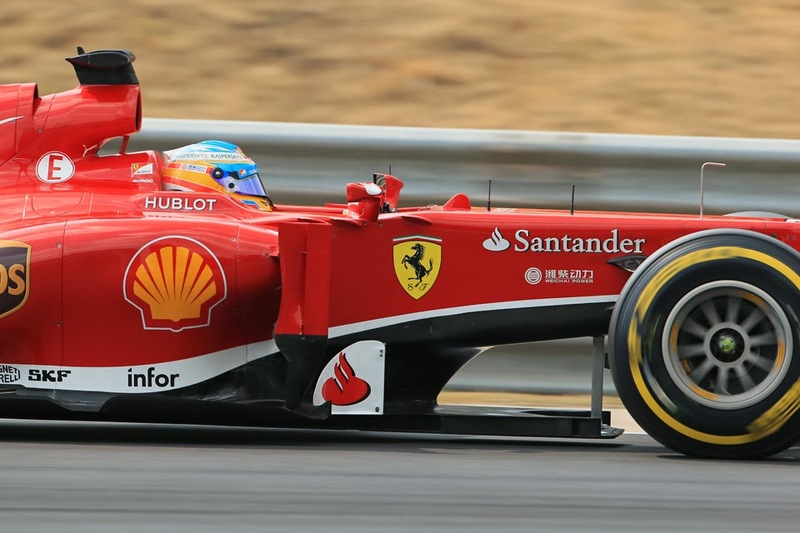 Alonso as mentioned sought to scupper Seb via a tortoise strategy, starting on the medium tyre and running long. A drawback of a tortoise approach is that early in the race there are many cars around to deal with, and this is what bit him, as a contretemps between Webber and Kimi Raikkonen sent Webber into his path, and the resultant contact damaged Alonso's front wing. He a couple of corners later tagged Jenson Button too, but by then the damage seemed long since done. A couple a slow laps then a stop for a new wing shot his fox (or should that be his tortoise?). And despite a subsequent run that featured good laptimes, he was swimming against the strategy tide and finished just out of the points. The vanquished Spaniard has the minor comfort though that his closest challengers in the drivers' table didn't make too much hay when the sun shone: Lewis Hamilton finishing sixth and Kimi seventh. There were a number of worthy drives in Seb's wake. Nico Rosberg - in that quiet way of his - smoothly motored to a comfortable second, leaving his team mate far behind as he did so. 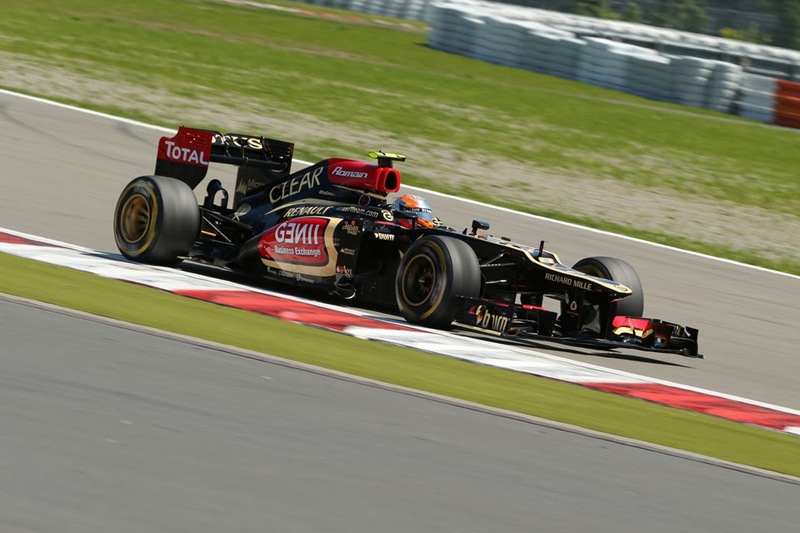 But probably the most remarkable run in the non-Seb class was that of Romain Grosjean. From starting P17 after a quali goof-up, and with the terse words of Pirelli ringing in his ears about the maximum number of tours it recommended on each compound, Grosjean ignored most of it with a one-stopper, including a mammoth 46 lap stint on the mediums. Perhaps even more remarkably his first stint on the softs lasted 14 when most struggled to reach 10. And he was still quick, and completed the podium after passing his cliff-hitting team mate late on. Felipe Massa went well to come home fourth, indicating that Ferrari did indeed have some legs this weekend. While it was a mixed bag for the afore-mentioned Kimi, who looked good for second place for a long time, trying an even more stripped-down one-stopper than Grosjean's, via pitting on lap 8. But as also mentioned he indeed hit the cliff late on, and pitted finally with a grand total of two laps left when he was really struggling and had nothing left to lose. Seventh was where he ended up. While at home it was a good weekend for Force India, splitting its strategies (Paul di Resta pitted on lap one and went for two long stints on the medium tyre; Adrian Sutil went for a long one-stopper starting on the medium) and being rewarded with a double points finish, P8 and P9, di Resta ahead. 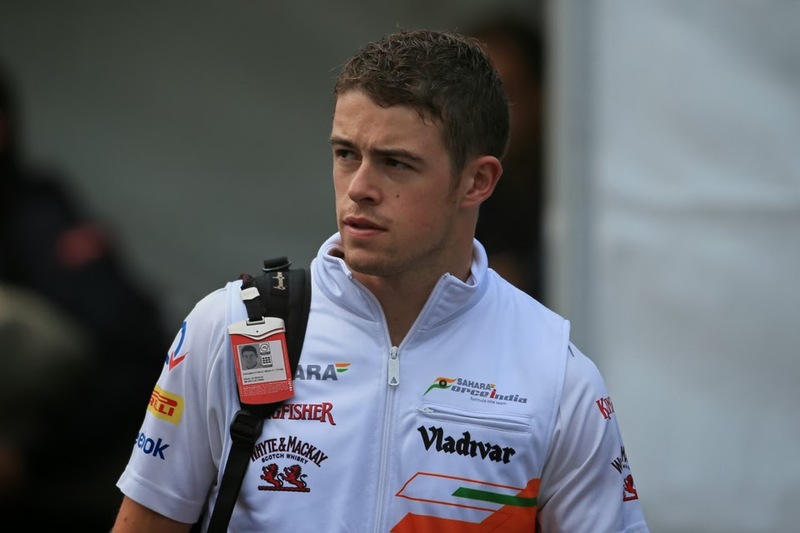 It reversed the momentum Sauber has had on them since the mid-season tyre switch - the Swiss team didn't score this time - and is also di Resta's first points since Silverstone. Following a good run in Suzuka he may be beginning to pick his way out of the rubble. In addition to Seb's triumph, today also marked the latest constructors' title becoming officially all Red Bull's too, just like Seb's its fourth on the spin - an achievement just as worthy as that of its driver. Perhaps more than any other driver-team pairing in F1 history Vettel and Red Bull are synonymous with one and other; in each other's image. Both attack each challenge with astonishing energy, verve and confidence - with a discarding of orthodoxy that only an insurgent can bring - which manifests itself absolutely in results. Despite levels and continuations of success for the pairing that have long since become familiar, perhaps wearisome, to the rest of us outwardly there has been absolutely no sign of relent so far. With yet another nod to Frank Sinatra, it can't be disputed that both did what they had to do and saw it through without exemption. They planned each charted course, each careful step along the byway. And more, much more than this, they did it their way.